In 2004 and 2005 we offered half-day science camps for young members of the community. Participants learned about fish physiology, marine ecology and environmental conservation in a fun and interactive environment. Our science education booth is a regular presence at the Ukee Days community festival. Staff members write informative articles on marine biology and ecology for the local newspaper. 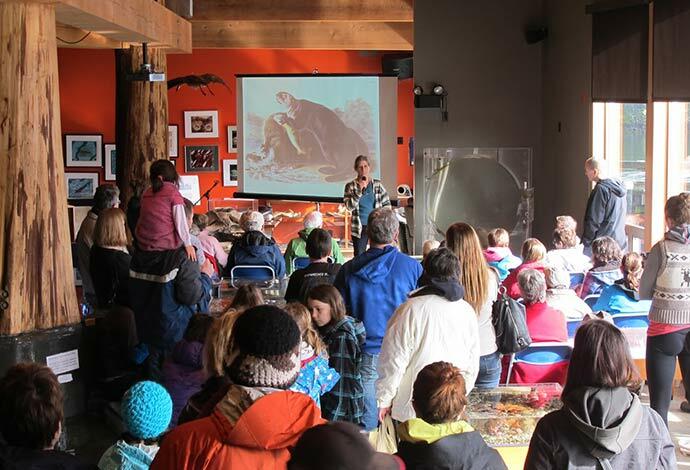 Staff members give educational public lectures in Tofino and Ucluelet. The Society has been working with local elementary and high schools to develop programs that enrich the science education curriculum. In 2007 the Society has received a grant from the Clayoquot Biosphere Trust to create a marine education manual. That manual is now being used to supplement our workshops and school programs, it is also available online under publications. In 2008 the Mini Aquarium hosted 16 Youth Biodiversity Workshops. During these hands-on education sessions students received personalized instruction from our staff, exploring such topics as food webs, carbon and nutrient cycling, predator-prey co-evolution and fish anatomy and development. This project was also funded in part by a grant from the Clayoquot Biosphere Trust.